Ginisang ampalaya or sauteed bitter melon is a popular Filipino vegetable dish. But the popular kind of ginisang ampalaya is with beaten eggs. This version has it’s Asian origin because of the fermented salted black beans or popularly known as tausi. It is common belief that to remove the bitter taste, you have to squeeze the sliced ampalaya with sea salt. But some are suggesting that you only have to soak it in brine to remove the bitter taste or soak it in water with a few teaspoons of baking soda. I suggest you try what really works. 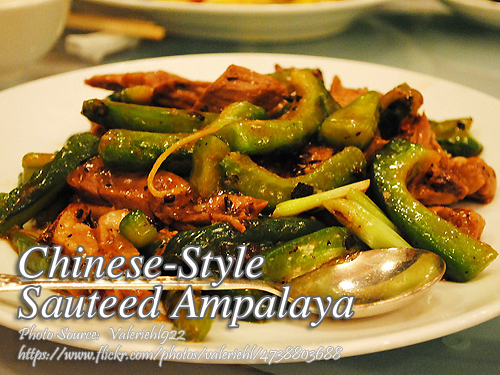 So if you are planning to cook an ampalaya recipe, I think this dish is a must try. To cook this dish; Slice and halve the bitter melon and remove the seeds. Then slice into thick diagonal pieces. Soak in water with a little salt for 10 to 15 minutes. Wash 2 times and drain to lessen the bitter taste. Do not squeeze. Set aside. Heat oil in a pan and saute garlic until brown. Add onion and stir cook for 2 minutes. Then add pork and tausi. Saute for a while and add 1/2 cup water. Cover and let boil till pork is tender and water has almost evaporated. Then add liver strips. Stir cook for 2 minutes then add the ampalaya, pour in another 1/2 cup water. Cover and stir only once. When ampalaya is half done, add dissolved cornstarch. Stir gently until the sauce thickens. Be careful not to overcook the ampalaya. To see the rest of the recipe with the exact measurement of ingredients, continue reading. Slice and halve the bitter melon and remove the seeds. Then slice into thick diagonal pieces. Soak in water with a little salt for 10 to 15 minutes. Wash 2 times and drain to lessen the bitter taste. Do not squeeze. Set aside. Heat oil in a pan and saute garlic until brown. Add onion and stir cook for 2 minutes. Then add pork and tausi. Saute for a while and add ½ cup water. Cover and let boil till pork is tender and water has almost evaporated. Then add liver strips. Stir cook for 2 minutes then add the ampalaya, pour in another ½ cup water. Cover and stir only once. When ampalaya is half done, add dissolved cornstarch. Stir gently until the sauce thickens. Be careful not to overcook the ampalaya. Serve hot. Thanks Loui for the kind words. Cheers! Informative and easy to make the recipe. Thanks for sharing with us.